Peptic ulcer disease represents a group of ulcerative disorders such as gastritis, gastric ulcers, and duodenal ulcers or gastroesophageal reflux disease (GERD). Treatment of peptic ulcers is achieved through drugs such as proton pump inhibitors (PPI), potassium-competitive acid blockers (P-CAB), antacid, H2-antagonist, antibiotics, and ulcer protective drugs such as sucralfate. Increasing usage of non-steroidal anti-inflammatory drugs such as aspirin due to increasing inflammatory conditions is the major factor driving the growth of the global peptic ulcer drugs market. However, side effects of long-term use of PPIs, changing government policies, loss of market exclusivity of a majority of peptic ulcer drugs, and limited R&D efforts in the field of peptic ulcer drugs are factors expected to hamper the growth of peptic ulcer drugs market, globally. This report covers the global peptic ulcer drugs market performance in terms of revenue contribution. The report includes key trends, drivers, restraints, and opportunities influencing the growth of the global peptic ulcer drugs market over the forecast period. Impact analysis of key growth drivers and restraints, based on the weighted average model, are included to provide clients with crystal clear decision-making insights. Based on product type, the global peptic ulcer drugs market is segmented into proton pump inhibitors (PPI), potassium-competitive acid blockers (P-CAB), antacids, ulcer protective drugs, H2-antagonists, and antibiotics. The PPIs segment is expected to remain the dominant segment in terms of value during the forecast period. By disease indication, the global peptic ulcer drugs market is segmented as gastritis, gastric ulcer, duodenal ulcer or gastroesophageal reflux disease (GERD). GERD segment is expected to dominate in terms of market share contribution, accounting for the maximum share of the overall market by 2022 end; whereas revenue from gastric ulcer segment is projected to expand at highest CAGR of during the forecast period. On the basis of the distribution channel, hospital pharmacies segment is expected to hold maximum market share in the global market for peptic ulcer drugs. By region, the market in North America is expected to lead in the global peptic ulcer drugs market. In 2014, North America and Europe collectively accounted for 67% share of overall marker revenue. Asia Pacific market accounted for 22% share in global peptic ulcer drugs market and is expected to gain significant market share over the forecast period, due to increasing recurrence of peptic ulcer disease. The MEA market is expected to witness sluggish growth during the forecast period partly due to low accessibility to peptic ulcer drugs in the region. Peptic ulcer refers to the group of gastrointestinal disorders including gastritis, gastric ulcers, and Duodenal ulcers or gastroesophageal reflux disease (GERD). Drugs used for the treatment of peptic ulcer include those which reduce gastric ulcer secretion such as PPI and H2 receptor antagonists, acid neutralization agents such as antacids and antibiotics against H. pylori infection. However, these drugs are often used in combination for effective treatment. Depending upon the product type, peptic ulcer drugs market is segmented into proton pump inhibitors (PPIs), Potassium-Competitive Acid Blockers (P-CAB), antacids, H2 antagonists, antibiotics, and ulcer protective drugs. On the basis of indications, the market has been segmented into gastritis, gastric ulcers, duodenal ulcers, and gastroesophageal reflux disease (GERD). By distribution channel, the global peptic ulcer drugs market is segmented into hospital pharmacies, private clinics, drug stores, retail pharmacies, and e-Commerce. The global peptic ulcer drugs treatment market was valued at US$ 32,200 Mn in 2014. North America led the global market 2014, accounting for 41.2% share of total global market revenue. The surge in use of non-steroidal anti-inflammatory drugs (NSAID) such as aspirin and growing awareness regarding treatment options for peptic ulcers are factors expected to drive the growth of the peptic ulcer drugs market in North America. The market in Europe accounted for a second largest share of 25.8%, primarily due to easy availability of successful treatment options for peptic ulcers in the region. 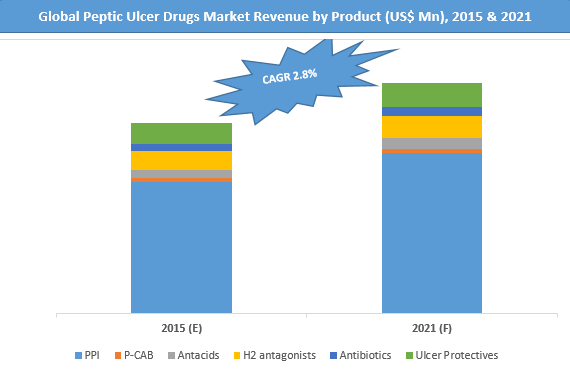 Revenue from the global peptic ulcer drugs market is projected to expand at a steady CAGR of 2.8% over the forecast period and is expected to be valued at US$ 40,004.3 Mn by 2022 end. North America is expected to remain the dominant market, contributing 41.5% share to the global peptic ulcer drugs market in terms of revenue. The PPI and H2 antagonist product segments collectively accounted for 79.2% revenue share in 2014. The gastric ulcer indication segment was valued at US$ 5,279.8 Mn in 2014 and is expected to register the highest CAGR of 3.0% over the forecast period. Factors driving the growth of the global peptic ulcer drugs market include growing prevalence of peptic ulcers, increasing adoption of peptic ulcer drugs over surgery, R&D stimulation through government policies, increasing a number of generic manufacturers of peptic ulcer drugs, changes in disease management etc. Furthermore, factors such as growing prevalence of stress-induced ulcers due to changing lifestyle and diet, increasing smoking rate, and progressive population of geriatrics are anticipated to promote the growth of the global peptic ulcer drugs market over the forecast period. However, side effects of peptic ulcer drugs, poor pipeline productivity, and changes in pricing policies of drugs are factors expected to hamper the growth of the global peptic ulcer drugs market during this period. Top players in the global peptic ulcer drugs market covered in this report are Daewoong Pharmaceutical Co., Ltd., Takeda Pharmaceutical Company Limited, Pfizer Inc., Abbott Laboratories, AstraZeneca plc., Cadila Healthcare Ltd., Boehringer Ingelheim GmbH, Eisai Co. Ltd., Yuhan Corporation, and GlaxoSmithKline Plc. These companies are focusing more on Asia-Pacific region, especially China and Japan due to high market potential attributed to growing disease prevalence.